Are you getting the most from your online business? 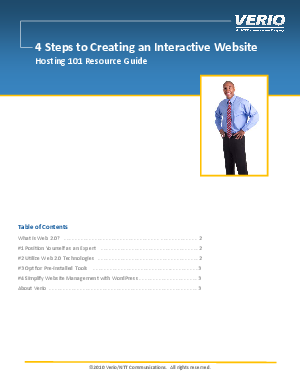 Download this guide for videos and demonstrations that show how turn your informational, online brochure into an interactive tool, with a Verio cPanel VPS Hosting solution. Discover how to make your small business website work harder than you by utilizing blogs, ecommerce and social media.